Mr.Alok Mohan interacting with the Hon'ble Prime Minister of India Shri Narendra Modi. 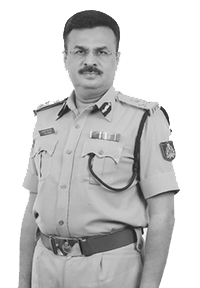 Mr. Alok Mohan is an Indian Police Service (IPS) Officer of 1987 Batch of Karnataka Cadre. He is presently serving as the Additional Director General of Police and head of the ‘Anti-Corruption Bureau’ for the State of Karnataka. He has more than 30 years of valuable Senior Management experience at the State, National and International Levels in the law enforcement and other public services. Mr. Alok Mohan has a glorious professional record. He has been a recipient of the prestigious President of India Police Medals for the ‘Distinguished Services’ as well as for the ‘Meritorious Services’. He has also been awarded with the prestigious “United Nations Medal” while working as Commander for the International Police Task Force (IPTF) in the United Nations Peace Keeping Operations in Bosnia – Herzgovina. He holds three Masters Degrees and is an alumni of the Kennedy School of Government, Harvard University, USA ; Lee Kuan Yew (LKY) School of Public Policy, Singapore University, Singapore, Jawaharlal Nehru University (JNU), New Delhi and the Indian Institute of Technology (IIT), Roorkee. Mr. Alok Mohan saluting the National Flag with DG & IGP Shri Pachau at The State Police Head Quarters Bangalore.